Abstract: Memantine, an N-methyl-D-aspartate receptor antagonist, is a well-established treatment option for moderate-to-severe cognitive impairment related to Alzheimer disease. Recently, growing evidence has indicated memantine might also be effective in treatment of affective disorders. The common drug-induced adverse events of memantine include confusion, dizziness, drowsiness, headache, insomnia, and agitation. Herein, we presented a case of a 73-year-old female patient with vascular neurocognitive disorder, who developed a manic episode after taking memantine. The glutamatergic system is one of the major excitatory neurotransmission systems in the central nervous system. Homeostasis in glutamate neurotransmission is fundamental for brain function. The N-methyl-D-asparate (NMDA) receptor plays an important role in glutamate neurotransmission.1 As a noncompetitive and low-affinity antagonist of the NMDA receptor, memantine is a well-established treatment option for moderate-to-severe cognitive impairment related to Alzheimer disease.2 In recent years, new applications of memantine has also been proposed for the treatment of acute manic episode and prevention of recurrent mood fluctuation.3 Memantine has been used as an adjuvant to treat major depressive disorder, bipolar disorder, and schizophrenia.4–7 Though the mechanisms of memantine for treating psychiatric disorders remains unclear, memantine can block the NMDA receptor competitively in the frontal cortex8 and then inhibit the function of glutamate, which further exert antidepressant effects.9 In this case study, we reported a 73-year-old woman with vascular dementia who experienced a manic episode after taking memantine. This case may help to enrich our understanding of neuropsychiatric adverse effects of memantine in elderly individuals. A 73-year-old woman was admitted to our hospital because of deterioration of memory and abnormal behavior for more than 1 year. According to her medical records, this patient had suffered from major depressive disorder for more than 40 years and initiated antidepressive therapy 10 years before this admission. She had taken mirtazapine and olanzapine for 1 year, and her mood improved and stabilized. She gradually stopped these medications under the surveillance of her doctor. Four years before admission, the patient suffered from acute cerebral infarction, which was possibly caused by atrial fibrillation. Her emotional level went down after this cerebrovascular accident. She became depressed and nervous, had difficulty in falling asleep, and would complain that somebody wanted to hurt her and her family members. She felt hopeless about her life and lay in bed every day. During that period, she hardly spoke and refused to eat. 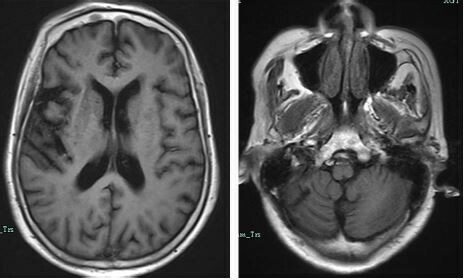 She was brought to our hospital, and cranial magnetic resonance imaging (MRI, 1.5T) revealed multiple encephalomalacia in the right cerebellar hemisphere, left occipital lobe, and left pons, along with ischemic changes in the bilateral periventricular regions and bilateral centrum semiovale (Figure 1). She was then sent to our department for further treatment. On admission, she was diagnosed with depressive syndrome caused by cerebral infarction and atrial fibrillation. Quetiapine (300 mg per night) combined with venlafaxine (225 mg per day) were prescribed. Her condition gradually stabilized in the following 2 months. This patient continued to take these medications, and 2 years before this admission, the dose of venlafaxine was reduced to 150 mg per day, and quetiapine 200 mg per night. Figure 1 Images from the first cranial MRI scanning of our patient. Abbreviation: MRI, magnetic resonance imaging. On this admission, the patient was well-orientated, but euphoric, childish, loss of self-insight, and abnormal behavior, such as garbage sorting and picking flowers, was observed. No hallucination or delusion was reported. Laboratory examinations, including routine blood test, biochemical profiles, tumor markers, infectious diseases, and thyroid function, were all within the normal reference ranges. 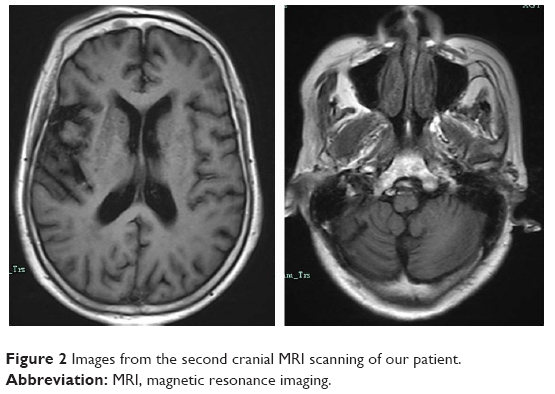 Cranial MRI scanning was performed again, and the findings were similar to the previous examination (Figure 2). No acute cerebrovasuclar events were reported. 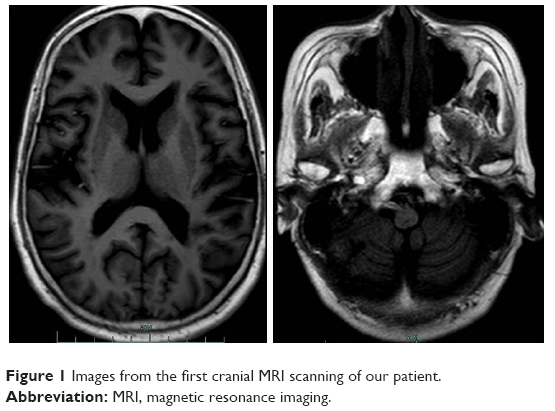 Figure 2 Images from the second cranial MRI scanning of our patient. The patient scored 18/30 on the Mini-Mental State Examination, and she had graduated from a senior high school. According to the Diagnostic and Statistical Manual of Mental Disorders (fifth edition), she was diagnosed with vascular neurocognitive disorder, with behavioral disturbance. Accordingly, venlafaxine was discontinued and the dose of quetiapine was increased to 400 mg per night. Meanwhile, donepezil 5 mg per night was also added for improving her cognitive function. However, she became emotionally unstable and fragile in the next 2 days, often crying and making noises by herself. The patient repetitively complained that she was abandoned by her children, and she would sometimes cry and sometimes smile for no reason. Escalating the dose of quetiapine to 600 mg per night also showed no significant improvement. Due to the poor treatment outcome, donepezil was discontinued and memantine at a dose of 10 mg per night was initiated. Her symptoms visibly ameliorated in 2 days. However, after taking memantine for 1 week, the patient became more and more excited and talkative. She could not stop talking and repetitively sought doctors for chatting. She laughed all the time, and even began to practice Tai chi in the ward. In view of her overexcitement, memantine was stopped and lithium carbonate 300 mg twice a day was prescribed. After ensuing the serum concentration of lithium was within the normal reference range, the dose of lithium carbonate was increased to 300 mg 3 times a day. Her emotions finally stabilized after taking lithium carbonate for 5 days. The Institute Ethical Committee of the First Affiliated Hospital, Zhejiang University School of Medicine, approved this case study. Written informed consent for publication of this case and any accompanying image was obtained from our patient and her guardian. In this case study, we reported a case of a 73-year-old woman with vascular neurocognitive disorder who experienced a manic episode after taking memantine. To the best of our knowledge, this is the first report of a memantine-associated manic episode. To conclude, this single case report presented a memantine-associated manic episode in an elderly female patient with vascular neurocognitive disorder and recurrent depression. Close monitoring of mood change in elderly patients with memantine treatment is necessary. This work was supported by grant 2016YFC1306900 from the National Key Research and Development Program of China, grant LGF18H090003 of the Basic Public Welfare Research Projects in Zhejiang province, and grant 2015C03040 of the Key Research Project of Zhejiang Province. The funding sources had no role in the study design; collection, analysis, and interpretation of data; writing of the manuscript; or decision to submit the paper for publication. Gao Y, Payne RS, Schurr A, et al. Memantine reduces mania-like symptoms in animal models. Psychiatry Res. 2011;188(3):366–371. Lipton SA. Paradigm shift in NMDA receptor antagonist drug development: molecular mechanism of uncompetitive inhibition by memantine in the treatment of Alzheimer’s disease and other neurological disorders. J Alzheimers Dis. 2004;6(Suppl 6):S61–S74. Serra G, Demontis F, Serra F, et al. Memantine: new prospective in bipolar disorder treatment. World J Psychiatr. 2014;4(4):80–90. Serra G, De Chiara L, Koukopoulos A, Serra G. Antimanic and long-lasting mood stabilizing effect of memantine in bipolar I mood disorder: two case reports. J Clin Psychopharmacol. 2013;33(5):715–717. Koukopoulos A, Reginaldi D, Serra G, Koukopoulos A, Sani G, Serra G. Antimanic and mood-stabilizing effect of memantine as an augmenting agent in treatment-resistant bipolar disorder. Bipolar Disord. 2010;12(3):348–349. Demontis F, Falconi M, Canu D, Serra G. Memantine prevents “bipolar-like” behavior induced by chronic treatment with imipramine in rats. Eur J Pharmacol. 2015;752:49–54. Canan F, Ataoglu A. Memantine-related psychotic symptoms in a patient with bipolar disorder. J Clin Psychiatry. 2010;71(7):957. Kornhuber J, Bormann J, Retz W, Hübers M, Riederer P. Memantine displaces [3H]MK-801 at therapeutic concentrations in postmortem human frontal cortex. Eur J Pharmacol. 1989;166(3):589–590. Stahl SM. Stahl’s Essential Psychopharmacology. 4th edition. Cambridge, UK: Cambridge University Press; 2016. Chen HS, Pellegrini JW, Aggarwal SK, et al. Open-channel block of N-methyl-D-aspartate (NMDA) responses by memantine: therapeutic advantage against NMDA receptor-mediated neurotoxicity. J Neurosci. 1992;12(11):4427–4436. Chen HS, Lipton SA. Mechanism of memantine block of NMDA-activated channels in rat retinal ganglion cells: uncompetitive antagonism. J Physiol. 1997;499(Pt 1):27–46. Xia P, Chen HS, Zhang D, Lipton SA. Memantine preferentially blocks extrasynaptic over synaptic NMDA receptor currents in hippocampal autapses. J Neurosci. 2010;30(33):11246–11250. Machado-Vieira R, Henter ID, Zarate CA Jr. New targets for rapid antidepressant action. Prog Neurobiol. 2017;152:21–37. McCloud TL, Caddy C, Jochim J, et al. Ketamine and other glutamate receptor modulators for depression in bipolar disorder in adults. Cochrane Database Syst Rev. 2015;(9):CD011611. Kishi T, Matsunaga S, Iwata N. A meta-analysis of memantine for depression. J Alzheimers Dis. 2017;57(1):113–121. Gideons ES, Kavalali ET, Monteggia LM. Mechanisms underlying differential effectiveness of memantine and ketamine in rapid antidepressant responses. Proc Natl Acad Sci U S A. 2014;111(23):8649–8654. Anand A, Gunn AD, Barkay G, et al. Early antidepressant effect of memantine during augmentation of lamotrigine inadequate response in bipolar depression: a double-blind, randomized, placebo-controlled trial. Bipolar Disord. 2012;14(1):64–70. Stevens J, Bies RR, Shekhar A, Anand A. Bayesian model of Hamilton Depression Rating Score (HDRS) with memantine augmentation in bipolar depression. Br J Clin Pharmacol. 2013;75(3):791–798. Strzelecki D, Tabaszewska A, Barszcz Z, Józefowicz O, Kropiwnicki P, Rabe-Jabłońska J. A 10-week memantine treatment in bipolar depression: a case report. Focus on depressive symptomatology, cognitive parameters and quality of life. Psychiatry Investig. 2013;10(4):421–424. Abbasinazari M, Adib-Eshgh L, Rostami A, Beyraghi N, Dabir S, Jafari R. Memantine in the prevention or alleviation of electroconvulsive therapy induces cognitive disorders: a placebo controlled trial. Asian J Psychiatr. 2015;15:5–9. Johnson JW, Kotermanski SE. Mechanism of action of memantine. Curr Opin Pharmacol. 2006;6(1):61–67. Naranjo CA, Busto U, Sellers EM, et al. A method for estimating the probability of adverse drug reactions. Clin Pharmacol Ther. 1981;30(2):239–245.